Alexander Gavrilov (angavrilov) changed the status of T63720: Parent Inverse is insufficiently explained in documentation from Archived to Resolved by committing rBM4642: Fix T63720: document the Parent Inverse matrix better..
Leonardo Kämpf (monatsend) added a comment to T63720: Parent Inverse is insufficiently explained in documentation. Alexander Gavrilov (angavrilov) renamed T63720: Parent Inverse is insufficiently explained in documentation from hidden factor of transformation with from parent deformed objects to Parent Inverse is insufficiently explained in documentation. panic added a comment to T63319: Bad link, needs rewrite. I'm not familiar with the Humane Rigging videos however there looks to be a playlist with the complete set here? Sebastian Parborg (zeddb) assigned T63702: Broken links in the documentation project homepage to Brecht Van Lommel (brecht). Sebastian Parborg (zeddb) triaged T63702: Broken links in the documentation project homepage as Confirmed, Medium priority. @Brecht Van Lommel (brecht) who is in change of this? panic created T63702: Broken links in the documentation project homepage. Jacques Lucke (JacquesLucke) closed T63673: trivial bug in Blender 2.8 API doc for math.utils as Resolved by committing rBf3b7b7eb0c3b: Fix T63673: Wrong api documentation for Quaternion.dot(other). Jacques Lucke (JacquesLucke) claimed T63673: trivial bug in Blender 2.8 API doc for math.utils. Arnold Smith (imagenor) added a comment to T63673: trivial bug in Blender 2.8 API doc for math.utils. Arnold Smith (imagenor) created T63673: trivial bug in Blender 2.8 API doc for math.utils. Brecht Van Lommel (brecht) raised the priority of T55018: Documentation for 2.8 (WIP) from Normal to Confirmed, High. Marking as high priority since this is a task we need to finish for 2.80. Bastien Montagne (mont29) resigned from D4615: Translate "Patch & Commit". William Huish (Fogey) updated the task description for T63319: Bad link, needs rewrite. William Huish (Fogey) triaged T63319: Bad link, needs rewrite as Normal priority. Eugene Choi (echoi7) added a comment to T62696: Comment with no line number problem. Tobias Heinke (TobiasH) added a comment to T51080: Blender Manual 404 page redesign . Bastien Montagne (mont29) closed T57957: Theme bug in 2.8 documentation site. as Resolved. looks like my local override of those bloody deb-package fonts was overridden by some package update… re-uploaded API docs now, should be working again. Brecht Van Lommel (brecht) closed T63102: Blender 2.8 manual references 2.79 API docs as Archived. I fixed the link inside Blender. Brecht Van Lommel (brecht) renamed T63102: Blender 2.8 manual references 2.79 API docs from Blender 2.8 executable and manual reference the 2.79 documentation to Blender 2.8 manual references 2.79 API docs. Brecht Van Lommel (brecht) triaged T63102: Blender 2.8 manual references 2.79 API docs as Confirmed, Low priority. Jean Da Costa (jeacom256) reopened T57957: Theme bug in 2.8 documentation site. as "Open". Phil Janson (PJ) created T63092: Typo in Modelling>Selecting>Lasso section. Richard Antalik (ISS) added a comment to T62604: Blender 2.80.48 Video Editing Adding Scenes that are selected in the outliner bug/behavior?. Thanks, I was busy this week haven't got even to respond to you. Brecht Van Lommel (brecht) closed T62604: Blender 2.80.48 Video Editing Adding Scenes that are selected in the outliner bug/behavior? as Resolved by committing rBM4595: Fix T62604: update docs regarding scene strips using same scene..
Bastien Montagne (mont29) raised the priority of T61902: Documentation for building Blender with Xcode doesn't work from Needs Information from User to Normal. Brecht Van Lommel (brecht) added a comment to T62604: Blender 2.80.48 Video Editing Adding Scenes that are selected in the outliner bug/behavior?. @Richard Antalik (ISS), you actually have commit rights to the documentation repository (username and password and are the same as for logging into this site). Jacques Lucke (JacquesLucke) added a comment to T62674: In the documentation, the armature tab is not obvious. There are a few other cases when Armature tab is used in the docs. Should they all be replaced with Object Data or should Blender be changed? Jacques Lucke (JacquesLucke) triaged T62674: In the documentation, the armature tab is not obvious as Confirmed, Medium priority. Jacques Lucke (JacquesLucke) triaged T62675: Missing end of sentence in bone animation documentation. as Confirmed, Medium priority. Bastien Montagne (mont29) placed T62696: Comment with no line number problem up for grabs. Fabien Freling (ffreling) updated the task description for T62674: In the documentation, the armature tab is not obvious. Fabien Freling (ffreling) updated the task description for T62675: Missing end of sentence in bone animation documentation..
Fabien Freling (ffreling) created T62675: Missing end of sentence in bone animation documentation..
Fabien Freling (ffreling) created T62674: In the documentation, the armature tab is not obvious. Richard Antalik (ISS) added a project to T62604: Blender 2.80.48 Video Editing Adding Scenes that are selected in the outliner bug/behavior? : Documentation. Task is more or less invalid, but docs should be fixed so I guess..
Brecht Van Lommel (brecht) added a member for Documentation: Pablo Dobarro (pablodp606). Brecht Van Lommel (brecht) closed T62374: Seconds instead of minutes as Resolved by committing rBM4591: Fix T62374: limits are in hours and minutes, not seconds..
Tobias Heinke (TobiasH) closed T54879: Searching from 404 page leads to 404 page as Resolved. version is still dev, the baseURL is read-only so it can't be changed by the inline script. Sebastian Parborg (zeddb) assigned T62374: Seconds instead of minutes to Brecht Van Lommel (brecht). Confirmed, should be 12 hours, 8.4 minutes. Julien DUROURE (julien) closed D4422: Add glTF to import/export page. Julien DUROURE (julien) accepted D4422: Add glTF to import/export page. Ed Mackey (emackey) added a comment to D4422: Add glTF to import/export page. @Julien DUROURE (julien) Can we add this? Thanks! Finn Bear (finnb) added a comment to T61875: Compositing node Vector -> Normalize inputs and outputs scalars not vectors. Also, where can I find "design tasks?" The vector category wouldn't be almost empty if a true "normalize" node was added. The current "normalize" node could be renamed "normalize channel." Ed Mackey (emackey) created D4422: Add glTF to import/export page. Chris Evans (mgchris) added a comment to T61902: Documentation for building Blender with Xcode doesn't work. @Arto Kitula (akitula) I used CMake GUI (3.14.0-rc2). Get latest code from master (From commit b9a37dd97acf6c4254e8246add7af05d68c8bf64). Build and get 30 build errors relating to Undefined symbols for architecture x86_64: for a bunch of boost methods. Arto Kitula (akitula) lowered the priority of T61902: Documentation for building Blender with Xcode doesn't work from Normal to Needs Information from User. It should not be necessary to manually set WITH_BOOST in any case, that would indicate a bug in the build system that needs to be fixed. Brecht Van Lommel (brecht) added a comment to T61902: Documentation for building Blender with Xcode doesn't work. Arto Kitula (akitula) added a comment to T61902: Documentation for building Blender with Xcode doesn't work. What exactly you'd like to edit? Did you first run make update under source tree before cmake/cmake gui? Jacques Lucke (JacquesLucke) added a comment to T61875: Compositing node Vector -> Normalize inputs and outputs scalars not vectors. Hmmm, I'm not sure... Maybe this should be discussed in a design task. William Reynish (billreynish) added a comment to T61875: Compositing node Vector -> Normalize inputs and outputs scalars not vectors. As @Finn Bear (finnb) points out, that could be argued for almost all the nodes in the Vector category. Jacques Lucke (JacquesLucke) updated subscribers of T61875: Compositing node Vector -> Normalize inputs and outputs scalars not vectors. @Finn Bear (finnb), you are right. That does not really make sense. 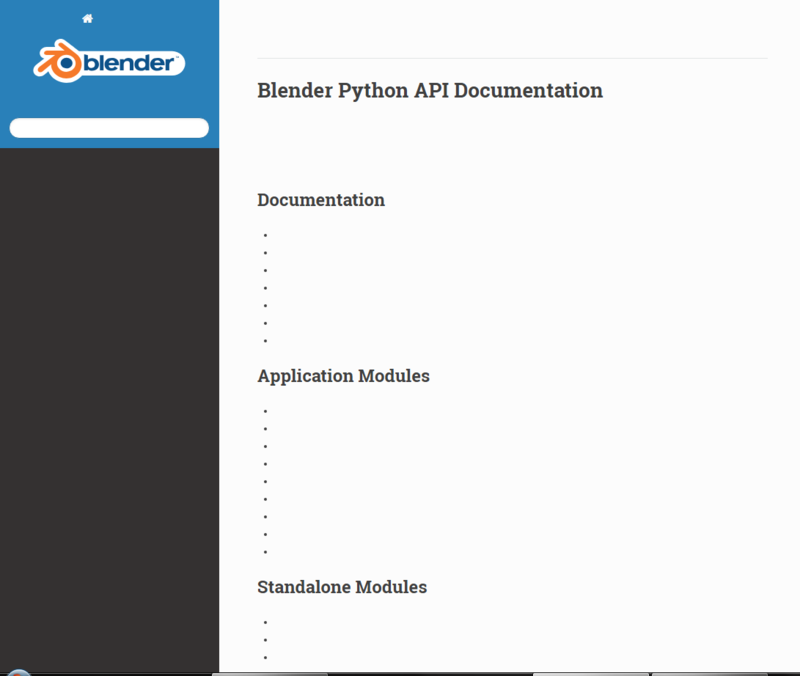 Joshua Newth (shamayimjosh) triaged T61966: Broken link concerning an excellent recommended external python scripting resource in the Blender 2.79 Manual as Normal priority. @Jacques Lucke (JacquesLucke) Now I'm wondering why this node is in the "Vector" category, and that actually applies to most of the nodes there. This nodes, except vector curves, really stretch the meaning of "vector." Sebastian Parborg (zeddb) assigned T61902: Documentation for building Blender with Xcode doesn't work to Arto Kitula (akitula). Jacques Lucke (JacquesLucke) closed T61875: Compositing node Vector -> Normalize inputs and outputs scalars not vectors as Resolved by committing rBM4574: Fix T61875: wrong normalize node description. Jacques Lucke (JacquesLucke) claimed T61875: Compositing node Vector -> Normalize inputs and outputs scalars not vectors. The actual problem here seems to be the documentation, not the implementation. Chris Evans (mgchris) created T61902: Documentation for building Blender with Xcode doesn't work. Aaron Carlisle (Blendify) added a comment to T61848: Path to preferences is wrong in the help documentation. This is fine, this is more of a known issue. Hopefully soon I will have time again to work on this. Dalai Felinto (dfelinto) closed T61848: Path to preferences is wrong in the help documentation as Archived. Not sure we are taking reports on the outdated manual. There are plenty of things there that are outdated. The images for instance. @Aaron Carlisle (Blendify) I closed this, feel free to open if you think you want to keep track of those. So, I wrote the extension: a fragile patchwork of ways making the links absolute. Split between the template, the extension, the inline script. or maybe it can be done in the extension I'll try it *later. 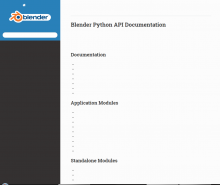 Yevgeny Makarov (jenkm) added a comment to T51172: Blender Documentation Roadmap. Is there any chance to see the possibility of online editing? At least, with the most simplified features for small edits. Yevgeny Makarov (jenkm) added a comment to T56342: FIle downloads: re-evaluate . It seems easier not to use the .blend files in the manual at all. Тoo many problems. There may be links to external files in the see more section, for example files from developers in release logs. Julien DUROURE (julien) closed D4082: Documentation for glTF 2.0 exporter. Julien DUROURE (julien) accepted D4082: Documentation for glTF 2.0 exporter. Brecht Van Lommel (brecht) added a comment to T48096: New Wiki. Tuomo Keskitalo (tkeskita) added a comment to T48096: New Wiki. Dan McGrath (dmcgrath) added a comment to T48096: New Wiki. Let's consider this resolved then. I have left a copy of the tarball in /root/en.blender.org.tar.bz2. Feel free to grab a copy (~5.5G). This contains the vhost docroot, the old txt only dumps, and the database dump. I wouldn't know what to do with that file, I just imagined you had someplace to archive these kinds of things. Brecht Van Lommel (brecht) updated the task description for T48096: New Wiki. Brecht Van Lommel (brecht) closed T48096: New Wiki as Resolved. I forgot to mention that the old vhost docroot files have be entirely deleted, as well as the original database. The old docroot is a mere empty skeleton, needed to satisfy the Apache docroot path, as well as provide a means for Certbot (Lets Encrypt) to acquire its certificates. Once the snapshots rotate enough, the space from the old files will be reclaimed. Brecht Van Lommel (brecht) triaged T61097: Wiki: port code architecture docs as Normal priority. Great! I guess that the 2 remaining points (Utilities and Delete the old read-only PHP wiki) can be wrapped up as well? After that, I propose to close this task and move any other todo to separate topics, tagged as Documentation. Francesco Siddi (fsiddi) added a comment to T48096: New Wiki. Francesco Siddi (fsiddi) updated the task description for T48096: New Wiki. Thanks @Tuomo Keskitalo (tkeskita)! And thanks @Brecht Van Lommel (brecht). From a quick look the archived wiki seems to be running well in all its legacy glory. Looking forward to the last steps that Dan will perform. Now it's just a matter of setting up a redirect from en.blender.org to archive.blender.org/wiki and taking the old wiki offline (I guess we keep a backup). @Dan McGrath (dmcgrath), can you do that? It looks great, I found no problems. Thanks a lot for doing this. Julien DUROURE (julien) added a comment to D4082: Documentation for glTF 2.0 exporter. Brecht Van Lommel (brecht) added a comment to D4082: Documentation for glTF 2.0 exporter. @Julien DUROURE (julien), you have commit rights to the documentation repository, so you can go ahead and commit this. @Martin Capitanio (capnm) : Documentation is how addon should work. If you detect a bug, please open an issue upstream (https://github.com/KhronosGroup/glTF-Blender-IO), but comments into documentation is maybe not the best place to keep trace of it. Martin Capitanio (capnm) added inline comments to D4082: Documentation for glTF 2.0 exporter.